To date, 173 tents have been set up, and nearly 2,000 residents are occupying the tents. Tents are installed in rows for easy access and management. We have been setting up each new tent after a genuine family arrives at the camp to avoid squatters. We have additional tents to accommodate nearly another 1,000 residents. 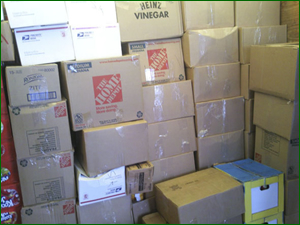 We expect that these will be occupied over the next 4-5 days. We have already constructed 12 toilets for the residents, and more are being constructed. The toilet rooms are made of cement blocks with proper desi style WCs, and a septic tank behind each block to drain out the sewage. We have set up 4 water tanks of 400 gallons. Water is pumped into these tanks from Kalri Lake using pumps. Kalri Lake is a fresh water lake (technically potable water having less than 400 TDS) which supplies water to Karachi city. We shall be arranging for additional water tanks in the coming week insha Allah. We have ordered one water filtration plant which is expected to be installed tomorrow. This will ensure that all viruses and bacteria in the water are filtered out and remove water borned diseases. All residents are registered with our staff. We have set up a few flood lights to provide general lighting of the area at night. More lights will be installed soon. We obtained a proper HESCO/WAPDA electricity connection for the camp. At the moment they provided a small transformer, but have agreed to upgrade it to a larger one since the current one does not cater to the required load. We have loads of water pumps and lights primarily. We hope to get the new transformer in place by tomorrow insha Allah. Dr. Agha Taj and his team are in the process of setting up the medical facility. Sigma Motors will be sending the ambulance tomorrow. By the way, for your information, the first baby was born at our camp. It created quite a stir and all our staff tried to become the midwives. Last Sunday, a team of Petarian Association led by Brig Mukhtar and Perways Inam visited the camp and surveyed the facilities. It was a great moment of cooperation, and TPA offered to send mats (chata'is) for each tent. We have been providing food rations to each family at the camp. We provide them rations for one week at a time. They cook their own food. We provide them with coal and they also use dry wood from the vicinity. Typically, the cost of food is around Rs. 400-500 per person per week. We currently have 3 trucks and one Landrover Defender at our disposal for getting all the supplies and moving our teams. Two of our young Petarians who just passed out from Petaro also spent a few days at the camp as volunteers. Currently we have a staff/volunteers of around 22 people at the camp to manage and operate the camp. * Our Abdalian teams have been busy in surveying the Garhi Momin village site to start work on constructing homes. * They have also done an initial engineering design of the type of home that will be constructed for the poorest of the poor. More designs are being prepared before a final decision is taken. * The designs are taking local requirements into consideration. It is proposed that each home will comprise of 2 rooms, a verandah, a kitchen and a toilet. The kitchen and toilet will be a separate unit behind the rooms in line with local traditions. * They will be using prefab slab for the roof, and bricks for the walls. * The size of one home will be a bit over 600sqft. * The estimated cost of construction will insha Allah be less than Rs. 200 per sq.ft. Thus one home is estimated to cost between Rs. 110,000 to 125,000. * Right after Eid, construction will begin on the first lot of 50 homes at Garhi Momin and Camp Karoona which are located 14km short of Peshawar on the Motorway. * We are also planning on doing similar homes at Utmanzai near Charsadda. * Depending on the total funds that we will have at our disposal, we will build that many homes insha Allah. 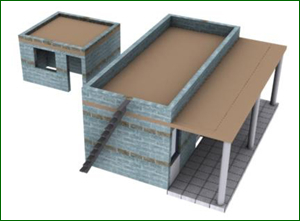 Following is a 3-D view of what a home might look like as per the first design done by the Abdalians. The unit at the back is the kitchen / toilet. We hope to do reconstruction work in Sindh as well. However this process may not start until at least 4-6 weeks from now depending on how fast the waters will recede. At the moment, most areas are still inundated with floods. We have received support in cash and kind from 15 countries around the world. Petarians and non-Petarians have come forth with full vigor to support this activity. 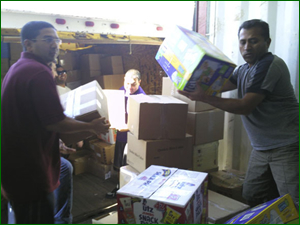 For example, this week some friends from NY/NJ loaded one 40 ft container of mostly food items that are being shipped to us. We hope to get receive this over the next 4 weeks and these will be distributed to the camp residents and IDPs for their consumption. 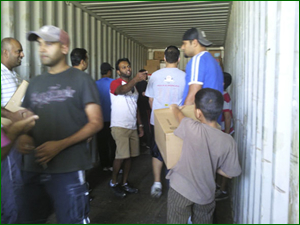 Following are couple of photographs of the container being loaded at NY by volunteers. More pictures will be on the website www.petarianfoundation.org.